Explores the fundamental concepts of sustainable wastewater treatment Uses the concept of mass balance to develop models applicable to various unit processes Examines energy production from wastewater treatment with calculations Addresses U.S. EPA and international standards Covers recent advances in nutrient removal concepts and technologies Contains more than 120 illustrations Supplies numerous worked-out examples in each chapter to demonstrate engineering applications Includes a variety of study questions and problems to test comprehension As the world's population has increased, sources of clean water have decreased, shifting the focus toward pollution reduction and control. Disposal of wastes and wastewater without treatment is no longer an option. Fundamentals of Wastewater Treatment and Engineering introduces readers to the essential concepts of wastewater treatment, as well as the engineering design of unit processes for the sustainable treatment of municipal wastewater. Filling the need for a textbook focused on wastewater, it first covers history, current practices, emerging concerns, and pertinent regulations and then examines the basic principles of reaction kinetics, reactor design, and environmental microbiology, along with natural purification processes. The text also details the design of unit processes for primary, secondary, and advanced treatment as well as solids processing and removal. Using detailed calculations, it discusses energy production from wastewater. Comprehensive and accessible, the book addresses each design concept with the help of an underlying theory, followed by a mathematical model or formulation. Worked-out problems demonstrate how the mathematical formulations are applied in design. Throughout, the text incorporates recent advances in treatment technologies. Based on a course taught by the author for the past 18 years, Fundamentals of Wastewater Treatment and Engineering is designed for undergraduate and graduate students who have some knowledge of environmental chemistry and fluid mechanics. Readers will get a strong grounding in the principles and learn how to design the unit processes used in municipal wastewater treatment operations. Professionals in the wastewater industry will also find this a handy reference. 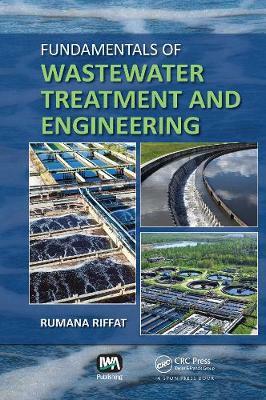 Author: Dr. Rumana Riffat is a professor in the Civil and Environmental Engineering Department at George Washington University in Washington, D.C. Her research interests are in wastewater treatment, specifically anaerobic treatment of wastewater and biosolids, as well as nutrient removal. She and her research group have conducted extensive research on processes to further reduce pathogens, such as dual digestion, temperature-phased digestion, and various pretreatment options. Her nutrient removal research has focused on determination of kinetics and evaluation of various external carbon sources for denitrification. Dr. Riffat received the Distinguished Teacher Award from the School of Engineering and Applied Science of George Washington University in 2011 and the George Bradley Gascoigne Wastewater Treatment Plant Operational Improvement Medal of the Water Environment Federation (WEF) in 2010. She is a member of several professional organizations, including WEF and the ASCE, and is a registered professional engineer of the District of Columbia.